After extensive research of traditional olive oil producers in Spain, Italy, Portugal and South America, the idea of creating a different, special organic premium olive oil for a small circle of gourmets arose. An oil manufactured like exclusive premium wine. Since 2010 an international team of specialists has been supporting this project, located in the south-eastern part of Mallorca an area which is favoured as far as climate is concerned. After extensive analysis of the local conditions, the three most suitable varieties: Empeltre, Picual and Arbequina were select and plandet in organic fields (certified ecological operation). The latest scientific observations were taken into consideration when planting and the newest technologies were used. This is all happening in order to create an organic olive oil of the best quality from the olives and to inspire gourmets. Ingeniero Técnico Agrícola, Master in Agricultura Ecológica (U.I.B. ), Lecturer at the University “Les Illes Balears” in Palma de Mallorca, specialist in fruit-growing and horticulture (University of Valencia), numerous publications, research projects, since 1979 advisor for ecological plantations, in the areas of: olives, wine and citrus fruits. In charge of the ecological supervision of our plantation. Ingeniero agrónomo, olive oil expert, specialist in olive growing and olive oil technology (University of Córdoba), olive cultivation and olive oil technology (University of Córdoba), Chairman of the Experts for Olive Oil Sensors of the COI (International Olive council), advisor for international olive oil producers (Master Blender) – the art of the “Master Blenders” lies in creating a homogenous, harmonious individual taste from our 3 varieties, OLI DE SANTANYI. Olive oil expert and oil maker from Toscana (Azienda Balduccio), Degustator at “Merum”, uncompromising advocate of quality, student of the international leading olive oil guru Dr Marco Mugelli (died August 2011), in charge of the processing of olives at the pioneers in the production of high-quality olive oil, i.e. the quality production and extraction of the oil in our high-tech mill. SO NEAR TO THE SEA, THE OLIVES ALSO BREATHE IN THE FRESH MARITIME AIR! 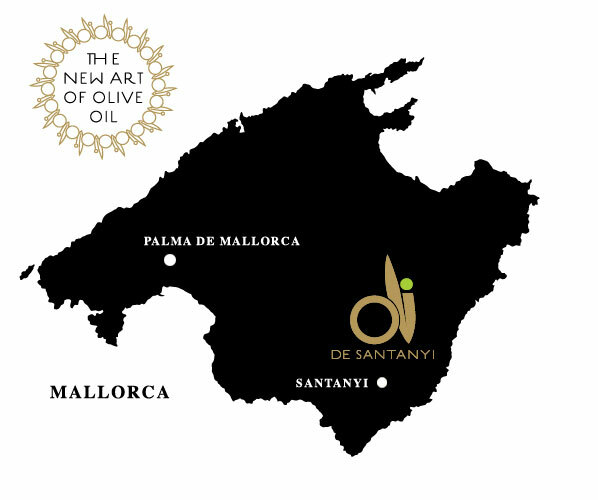 The OLI DE SANTANYI olive groves are located on the wonderful coast of the south-eastern part of Mallorca close to the Modragó National Park. Here, amidst the coast with its white beaches, a sea that shimmers in tones of blue and turquoise and the mountains of the Serres de Llevant, a special microclimate reigns, enabling the cultivation of organic olives of unique quality. This is where the OLI DE SANTANYI olive trees of the typical Mallorcan olive varieties, Empeltre, Arbequina and Picual grow. An invitation to take a virtual tour through the OLI DE SANTANYI olive world.